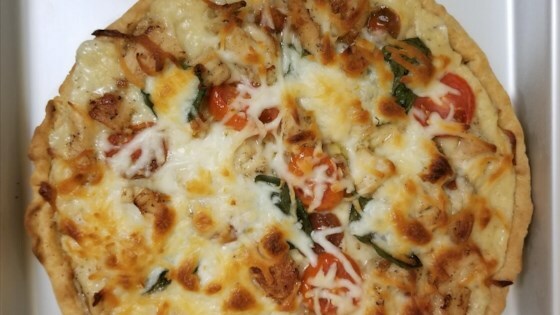 "Great for vegetable pizza, meat pizza, or pasta. Brush your favorite pizza dough with olive oil, spread sauce, add your favorite toppings, and bake per dough instructions. Also great for calzones or chicken, or chicken and broccoli with fettucine. Makes enough sauce for 2 medium pizzas. Freezes beautifully. Just thaw at room temperature." Heat butter and olive oil in a small saucepan over medium heat; cook and stir onion and garlic until tender and fragrant, about 1 minute. Add flour and whisk until flour is lightly browned and onion is translucent, 2 to 3 minutes. Mix milk, Parmesan cheese, basil, oregano, salt, and black pepper into onion mixture. Cook, whisking continuously, until cheese is melted and sauce has thickened slightly, about 5 minutes. Remove from heat. Mozzarella cheese or 3-cheese Italian cheese blend can be used in place of the Parmesan cheese, if desired. Dried basil can be used in place of the fresh basil. Add more milk if sauce is too thick in step 2. It was too thick, almost gravy like. Not good. This was delicious! It's better than white sauce in pizza chains! Delicious! We used Italian Seasoning instead of just basil and oregano. We used rice flour to make it gluten free. Omitted the black pepper because of allergies.